The Largest Seed In The World Is The? What Did The First Vending Machine Dispense? In the plant world there are many, many, teeny tiny seeds to be found. There are even more than a few hefty ones, like the large seeds found within the meat of fruits like the peach, mango, and avocado. But among large seeds, there’s a significant distinction between the “big enough to heft in a single hand” category, like the smooth seed of an avocado, and “so big you’d better bend your knees and use both hands” like the absolutely massive seed of the palm tree Lodoicea maldivica, commonly known as the coco de mer or sea coconut, that averages around 20 inches (51 centimeters) across and weighs approximately 55 pounds (25 kilograms). 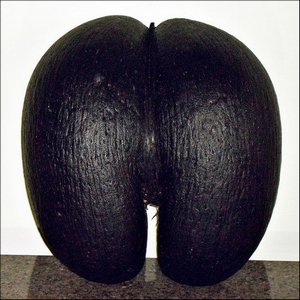 Despite how the name might imply that the sea coconut is a water-borne plant that is dispersed by the sea, only rotted out coco de mer seeds (nuts) float effectively, which is why the palm tree is limited in range to five islands (endemic to two and reintroduced to three) in the Seychelles archipelago off the coast of Africa in the Indian Ocean.